In June 2017, Fiona Onasanya was elected Member of Parliament for Peterborough. On 29 January 2019 she was sentenced to 3 months imprisonment for preverting the course of justice. False information had been supplied in reply to Notices of Intended Prosecution (NIPs) for three speeding offences. The judge took into account her previous good character and considerable personal mitigation. Her brother, Festus Onasanya, was sentenced to 10 months imprisonment on each of 3 counts of perverting the course of justice in relation to false information supplied in response to NIPs - the sentences to be concurrent. The sentencing remarks of Mr Justice Stuart-Smith are available via the Judiciary website. The case was reported by The Guardian 29 January. Festus Onasanya completed the returns requesting information as to the drivers and supplied the name of Aleks Antipow. By November 2017, Fiona Onansanya was aware that false information had been supplied but she did not act to correct the matter. The judge was satisfied that, on one of the occasions, Fiona Onasanya was the actual driver. This offence was said to be driving at 41 mph in a 30 mph limit. Under Magistrates' Court Sentencing Guidance that offence would attract a maximum possible fine of £1000 with the driving licence endorsed 4 to 6 points. A short disqualification of 7 to 28 days is also a possibility. 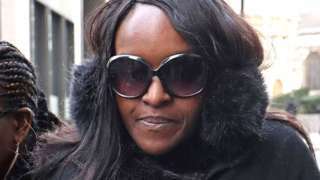 It remains to be seen whether Ms Onasanya appeals either conviction or sentence. The Recall of MPs Act 2015 permits the recall of an MP under the "first recall condition" if (a) the MP has, after becoming an MP, been convicted in the United Kingdom of an offence and sentenced or ordered to be imprisoned or detained, and (b) the appeal period expires without the conviction, sentence or order having being overturned on appeal. A recall petition is successful if the number of persons who validly sign the petition is at least 10% of the number of eligible registered electors. MPs who receive custodial sentences of more than 12 months are disqualified under the Representation of the People Act 1981. It is reported - BBC News 31 January - that the Attorney-General is considering referring the sentence to the Court of Appeal under the unduly lenient sentence provisions. There have been recent calls to abolish the use of short-term imprisonment or, alternatively, to introduce a presumption against the use of short-term imprisonment. According to the Prisons Minister - Mr Rory Stewart MP - short term sentences are "long enough to damage you and not long enough to heal you" - The Independent 12 January. In 2018, the Prison Reform Trust argued that there should be a presumption against the use of short-term sentences. Such a presumption was introduced in Scotland by the Criminal Justice and Licensing (Scotland) Act 2010 section 17. Such a presumption appears preferable to abolition. There can be little doubt that short-term sentences are ineffective if viewed solely from the viewpoint of rehabilitation because minimal rehabilitation work is done with prisoners serving such sentences. However, for adult offenders, rehabilitation is one of five statutory sentencing objectives - (a) punishment of offenders; (b) reduction in crime (including reduction by deterrence); reform and rehabilitation of offenders; (d) protection of the public; (e) making of reparation - Criminal Justice Act 2003 s.142. An appeal was refused - The Guardian 5 March 2019. The MP for Peterborough will be the subject of a recall petition after being told by the Court of Appeal that there were no grounds to challenge the prosecution’s case that she had repeatedly lied to avoid a speeding ticket. Following the court ruling, the House of Commons’ Speaker, John Bercow, confirmed that he had written to the Cambridgeshire city’s petitions officer under the provisions of the Recall of MPs Act 2015.
seems like such a crazy sequence of events - so unnecessary, really.